"Delicious shrimp dish with a Cajun flair! I've spent 6 years perfecting this shrimp recipe. I use shrimp harvested from a local shrimp farm. This is also great with firm crab meat or fish!!" In a large skillet, melt butter and saute onions, celery and garlic for about 45 minutes or until they are cooked down. Stir in flour and cook briefly, do not brown. Stir in chopped shrimp and cook for 20 minutes. Pour in 2 to 3 cups of water and mushrooms. Stir in paprika and season with salt, pepper and red pepper flakes. Cook for 30 minutes. Should be a thick and have a gravy-like consistency. 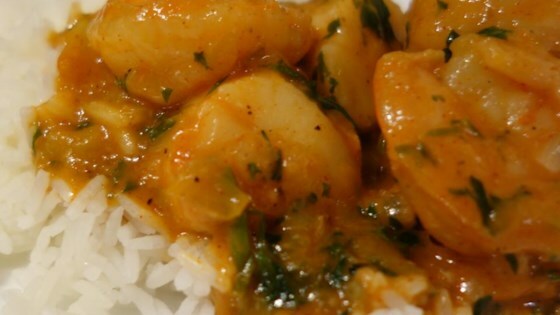 Discover the tricks to making amazing Creole shrimp with a flavorful gravy. Be careful if you reduce the number of servings down from 20, as the text of the recipe does not reduce accordingly. I liked this but my husband wasn't crazy about it.